Rudolph Castillo, an economist and former corporate manager at the Belize Bank, told Amandala today that he has partnered with EKOL, an energy corporation in the Czech Republic, in coming up with a $350 million proposal for the establishment of a 30 megawatt (MW) facility which would produce energy, first from wood chips, but later from the hard shell of the cohune nut – the kernels of which they also intend to cold press to produce cohune oil. The oil would be produced at a sister facility which will require a further $15 to $20 million in investment, but which, Castillo said, could produce 32 metric tons of oil per day, netting a projected $160 mil annually. “I thought I was going to be a banker for life,” Castillo told us. We told him that some people will wonder whether he is fronting for Belize Bank principal, Sir Michael Ashcroft. Castillo said that he has never personally met Ashcroft. He told us that financing for the project would be provided by Erste Corporate Banking in the Czech, with 30% equity from the investors in the company. Castillo said that he retired from the Belize Bank to pursue the project, on which he has been working for the past 3 years. “Cohune will surely put Belize on the map for innovation in energy and biofuels and other cosmetics and pharmaceuticals,” he told us. According to Castillo, the idea came about after he bought a bottle of cohune oil at Sky Supermarket in Ladyville thinking it was coconut oil. Castillo said that the cohune oil has tremendous export potential. He told us that the oil has 46% lauric acid, is good for the heart and is useful for cosmetics, since it is beneficial for the skin. Amandala understands that the Government of Belize is assisting entrepreneurs in Flowers Bank who have also embarked on a cohune project funded by UNDP, to upscale their facilities, and grant funding will be sought from Japan, which has also supported solar power renewable energy projects in Belize. Under the name Cohune Energy Ltd., the 50-50 joint venture between Castillo and the investors from the Czech Republic, a 30 MW facility – which Castillo described as “a state of the art ‘BMW’ facility,” built in Europe – is proposed in the first instance. Castillo told us that their ultimate objective is to pursue the cohune facility, and they are not the company which has proposed to switch from cohune to bamboo for power generation. The cohune tree is one of the most resilient tropical trees. The Maya use it for making thatch housing. He told us that Cohune Energy Limited has entered into a memorandum of understanding with a land owner, who has 30,000 acres of land in the Armenia area, just outside of Belmopan. The property does not currently have enough cohune trees to meet the project’s demands, and so they will first generate power by burning wood chips from eucalyptus trees, a rapidly regenerating tree which will be imported for planting, along with the various species of trees already on the property, which he said stand at roughly 1.8 mil tons of biomass. These would be replaced over a period of 7-8 years with cohune trees. He said that ten years is the shortest timeframe within which cohune can become sustainable at the proposed commercial level of a million pounds per day. Castillo said that the power plant will take two years to build, and the idea is that by the end of 2016, they could start selling to the national grid. However, the first phase is a transition phase and would not involve the production of energy and oil from the cohune. 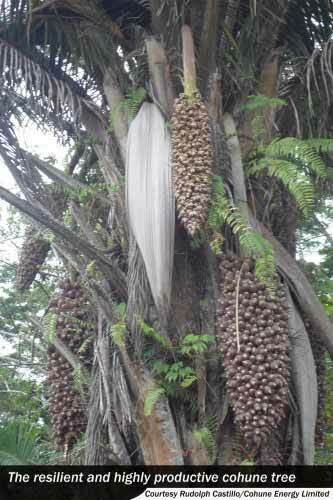 The investor said that tests on the cohune nut’s energy potential indicate that it can produce energy of superior quality from what has been proven to be a very resilient plant indigenous to Belize and the region, being one of the trees which remained standing after Hurricane Richard pounded Central Belize in 2010. Castillo also noted that the Government’s energy policy calls for biofuel production from indigenous resources. He added that the project would generate an estimated 500 jobs, involving mostly labor-intensive work. “This is something worth pursuing,” Castillo said. His company’s bid will be ranked among over 20 power generation bids which are being reviewed by the Public Utilities Commission (PUC). Bids will be selected to fill a quota of 75 MW, preferably biomass or renewable energy, with 15 MW coming from wind and/or solar power. Castillo said that they are seeking a power purchase agreement spanning 20 years.